Disclaimer: This is not a sponsored post. I received some items of clothing in exchange for an honest review. All words and opinions expressed are 100% my own. 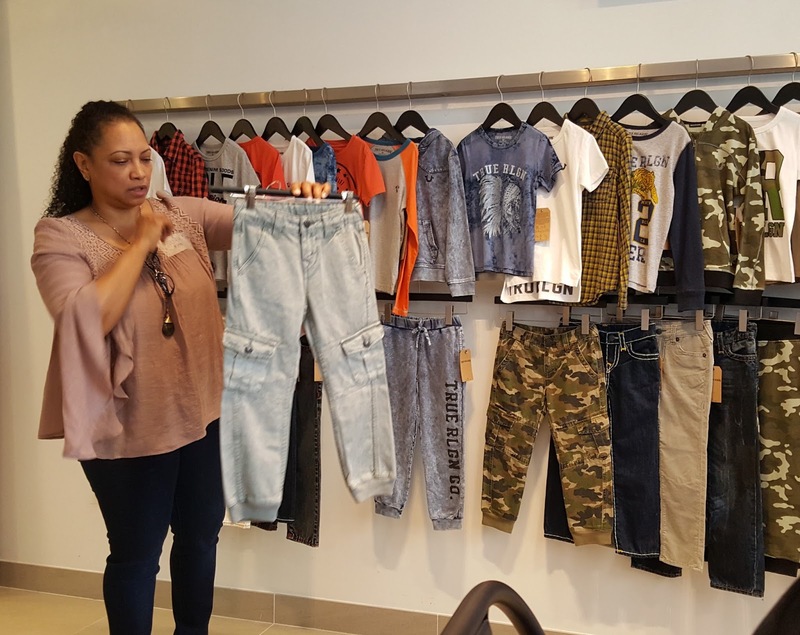 Last month we had the opportunity to have a shopping day with some amazing brands. I was able to personally check out two specific brands and have some one on one time to check out some of their latest styles to come out this upcoming Fall and being able to talk to the team members behind each brand was great. It's always nice to meet the team behind some of your favorite brands and listen to all of the hard work that goes on behind the scenes. One of them was True Religion, an original brand that emerged in Los Angeles in 2002. Known for it's amazing five needle thread at two stitch per inch process and known for their Super T in the denim industry. A denim that you've surely encountered when shopping, I mean you can't miss their iconic horseshoe stitched in the back of each pocket. As a mom quality, comfort, and cuteness is always a must for me, especially when your little one is a wild one. Valentina is always on the run and when I go shopping for her I make sure to find clothes that is comfortable enough for her to run around in and is soft enough for her to be in it all day, as for the cuteness factor it's always a must. One thing that I really loved upon inspecting the True Religion jeans are that they offer an adjustable elastic in the waist, that way if your child is tall but slim you can always adjust the waist. That's our case with Valentina, she is a very tall 2 and a half year old and always needs a size or two bigger in bottoms but they always end up being too big in the waist. With True Religion I was able to get her a size 4 and just fix adjust them in the waist. You have to love a brand that is always on top of styles and what's hip with kiddos these days. This Fall True Religion is really having fun with camo, prints, and colors. My son loves sweat pants with elastic in the bottom and True Religion has some amazing joggers coming out this Fall. They are soft jean material perfect for the boy who only wants to wear only sweats, they will love these joggers that are made out of jean material. They will also have some cute tops with studs perfect for the little fashionista in your life. During our shopping day we got to pick out 4 items, 2 for each child. I made sure to pick out a classic pair of jeans for Valentina and this cute top with a 3/4 length sleeve with touches of red and just a hint of sparkle, not too much that hurts the eyes and it doesn't rub off when you touch it. Perfect for these Fall days as the weather cools down, just grab those walking shoes and go for a stroll through the park or in my case a run, as i'm always running after Valentina. Plus, I love that I don't have to worry about her falling down and damaging her jeans because they are really tough, not tough that they are not soft but tough that they will withhold when your child falls down a few times. Valentina couldn't stop looking at her reflection. Both items are a size 4 and have enough space for Valentina to grow into, she will definitely use these for two Fall seasons and I am perfectly ok with that. True Religion is definitely a nice investment. 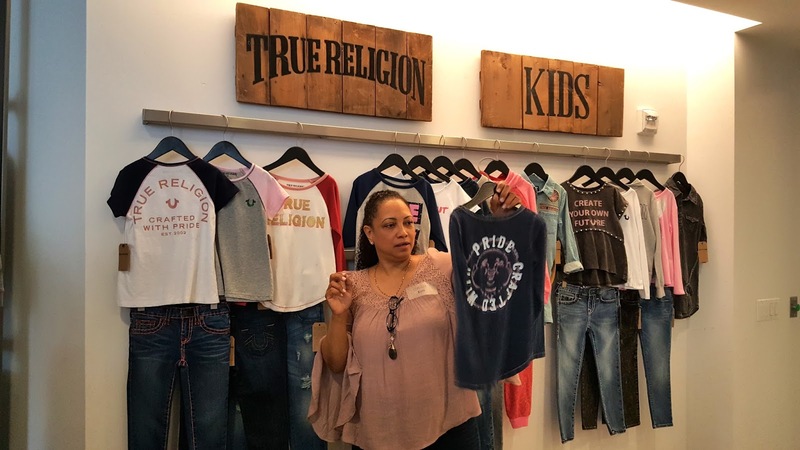 Make sure to check out True Religion this Fall and follow the so you can stay in the loop with the all the new styles to be released. Make sure to stay tuned to see what I picked for Miguel and how he will be ready for this upcoming Fall season! 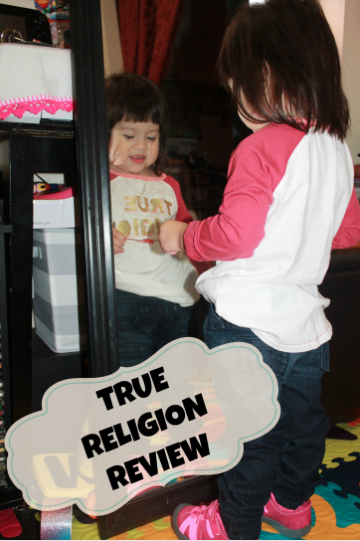 12 comments on "True Religion Review"
Excellent review and pictures. I love True religion, I think their jeans are great. OMg what a cutie you have. I am loving that outfit it looks good. I am a big fan of True Religion, a little higher priced, but definitely worth the money. Those are the cutest outfits ever! I might just need to get my cousin some as I'm sure she'd adore them! So cute! I do not know this brand of jeans but they look lovely. I wonder if I can get the brand over here in Europe, will need to check. Love these outfits. They're amazing. I actually had a look on the website and loved the adult clothes too. How cute are your kiddos!! I've never shopped there and now I'm wondering why. Love those jeans too. What a cute outfit! I love the shirt and the jeans are so perfect for back to school. Cute outfit! I love pants for wee ones that have an elastic or draw string waist! Kids come in all sizes and clothes need to fit accordingly! I do love True Religion though I rarely splurge for it. She is such a cutie! I remember when my stepson was going through a True Religion phase. I have never seen the line in very lil' kid sizes…very cute.